Hide treats in the Dog Smart by Nina Ottosson for the fun to start! Place treats under the hollow plastic bones on the board to start the search. The game provides endless fun for pets and their owner. This Nina Ottosson game has been renewed. For example, the design of the bones has changed; one side of the bone is more narrow, making it more challenging for your dog to pick them up. By changing the way you put the bones on the board, you can make the game even more challenging. Furthermore, it is made of another material, with consists of 50% recycled plastic. It is safe for your dog to play with and makes the game easy to clean. 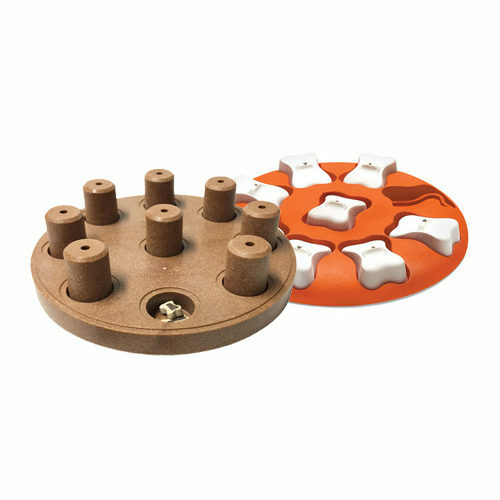 The Dog Smart game by Nina Ottosson consists of hollow plastic bones that are placed on a board. Hide treats underneath the bones while your pet is watching and allow them to find treats by moving and lifting the bones. The level of difficulty for the Dog Smart is level 1. Please look here for more information about the games of Nina Ottosson. Please note: This game is suitable for all dogs, regardless of age, breed and size. The Dog Smart is also suitable for rabbits. Make sure that this game is always given under constant supervision. The Dog Smart is made of recycled plastic mixed with wood (50/50), which makes it easy to clean with water and soap. Make sure there is no soap left in the game before giving it back to your pet. Have you used Nina Ottosson Dog Smart before? Let us know what you think about this product.